Not exactly a rookie when it comes to food cures, fiber is nevertheless the focus of an extraordinary new study. Men who eat a high-fiber diet might have the potential to control the progression of prostate cancer. Let’s start with a contrast: in the West, prostate cancer tends to progress, while in Asian cultures, it does not. This tendency exists despite there being similar rates of this cancer in the populations. 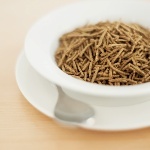 The answer is now believed to be dietary fiber. The health breakthrough comes, as many do, through the study of mice. Researchers fed some mice “inositol hexaphosphate” (IP6), a major part of high-fiber diets, while other mice did not receive it. They then used MRI to see how prostate cancer progressed in the two groups. The researchers call these “profound” results. The tumor volumes were drastically reduced in the presence of a high-fiber diet. This is directly the result of IP6 working against the cancer. What happened was that IP6 kept prostate tumors from producing the new blood vessels necessary for the tumors to supply themselves with energy—no energy, no growth. They further speculate about why IP6 works in this way, but it becomes too heavily technical. What we must understand is that Asian cultures tend to get more IP6 in their diet than Western cultures do. And this could be a big factor in why prostate cancer doesn’t spread as much in those countries. Fiber is a critical part of a well-functioning digestive tract and is known to help shield the body from a wide range of minor to major health conditions. It goes without saying that any man with prostate cancer can safely eat more fiber every day, and it just might be helping control the tumor inside him. Berman-Booty, L., et al., “Suppression of Prostate Epithelial Proliferation and Intraprostatic Pro-Growth Signaling in Transgenic Mice by a New Energy Restriction-Mimetic Agent,” Cancer Prev Res, published online December 28, 2012.